In the past I’ve tended to overlook the Kaimanawas. Driving along the desert road, the mountainous areas of Tongariro National Park on the other side have usually grabbed my attention, whereas legends of wild horses in the Kaimanawas give the impression of them being a rather large, publicly-owned pet food factory. Wellington Anniversary Weekend was a good introduction which challenged my perceptions, and I discovered I was wrong before the trip even began. 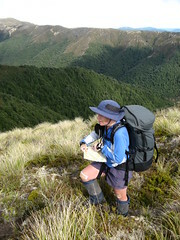 Contrary to my former impressions, I found that much of the Kaimanawa Range is privately owned. I was going to start this report with some background information about the private land issue in the range, but I decided to post that part separately  after it became a bit long. 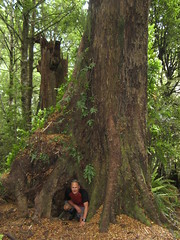 Location: Kaimanawa Forest Park, Urchin Road-End. People: Craig, Ruth, Paul, John, Mike and me. 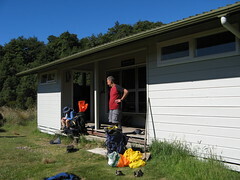 Huts visited: Waipakihi Hut (1 night). 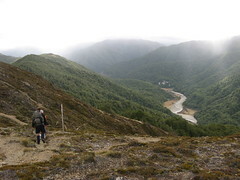 Intended route: Begin at the Urchin road-end, walk over Urchin to the Waipakihi River, up Motutere and around Middle Range past Thunderbolt, down to Waipakihi Hut for the night. Then out to the Umukarikari road-end via the Umukarikari Range, camping somewhere. Actual route: Over Urchin and up the Waipakihi River to the hut, back over Te Hiwiokaituri Ridge and back down to the river before camping overnight, then out over Urchin. This was a trip of altimeter arguments, contradicting and incorrect weather forecasts, and a high quantity of photographs of varying quality. In fact, the trip was so much about altimeter arguments and taking photographs that I couldn‘t possibly do those topics justice, so I won’t spend much time mentioning them from here on. The six of us were accompanied to the end of the road by Geoff and Yibai. Geoff had offered to drive the bus while Yibai had offered to make sure the door of the bus opened and closed at the appropriate times. The two of them planned to go hunting while they waited for us to return. Having left Wellington at about 6 with a 30 minute stop for dinner at Bulls, we arrived at the Urchin road-end at about 11.20pm. Ruth knew of a good campsite clearing a few minutes’ walk in the opposite direction from the start of the Urchin Track, and that’s what we aimed for. As it turned out, Mike and I were the only people interested in setting up a fly, but even we gave up after trying to get the first peg into the very hard ground. It was a calm night so we joined everyone else and put away the fly, sleeping out in the open. We were all settled and on our way to sleep by about midnight. I think I must have slept well because after falling asleep underneath the constellation of Canis Major, the next thing I remember was being under a dense part of the Milky Way which was most likely near Sagittarius. By the time the Southern Cross was overhead, traces of dawn were showing, and a sprinkling of songs started echoing through the trees. The two most prominent belonged to a Grey Warbler, and what I think were Bellbirds. We didn’t have any significant problems with dew on people’s sleeping bags, although Paul’s had somehow gotten slightly wet on the outside, possibly if he’d somehow rolled it into a puddle. There’s no source of water at the Urchin road-end, which is important to note because the first water available on the journey still requires a 600 metre climb followed by a 450 metre descent before reaching the Waipakihi River. Fortunately Ruth had thought ahead, and left a 3 litre bottle of water on the bus that we could raid before we left. Somehow everyone in our group had turned up with a different forecast for the weekend. They all contradicted each other, but none of them were particularly good forecasts and the main thing we determined having mashed them together was that Saturday was likely to be the best day. From Sunday onwards things would probably get steadily worse – in some cases a lot worse. With this in mind, we decided to attempt a very long day on Saturday to get around as much of Middle Range as possible, hopefully all the way to the hut, and would later decide how to use up the remaining two days. We left our campsite near the Urchin road-end just before 7. After a quick stop at the bus, we began walking up the hill, with Craig making subtle comments about the unusual heaviness of his pack. The track from the road-end up to Urchin is a nice, consistent gradient, and the ground is quite soft which makes it good to walk on. 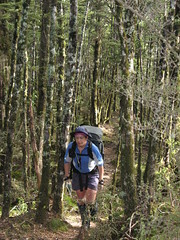 We reached the bush-line at 8.15am, and the wind progressively picked up from there, complete with wind chill. Less than 10 minutes later having arrived at Urchin Trig, it was actually getting quite cold. We re-assessed the day’s plan once we broke onto the tops and could see the rapidly moving clouds to the east which suggested suggested that Middle Range, along which we’d intended to walk, was probably sheltering us from something much worse coming from the north-east. Instead, we decided to spend the day walking up the river in the valley below. 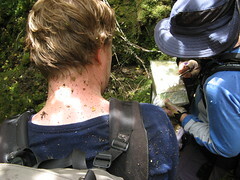 The Urchin Track is poled along the tops, which makes it easy to find the way down to the track in the bush-line on either side. Although cold and windy enough for everyone to add an extra layer, it wasn‘t too much to manage and the visibility was good. We covered the 2 kilometers or so on that part of the tops without much trouble, and were on our way down into the bush on the other side within 45 minutes. The Urchin Track heading down the south-eastern side is quite a bit steeper than the other side by comparison, but really no worse than a typical up-hill track in the New Zealand back-country. 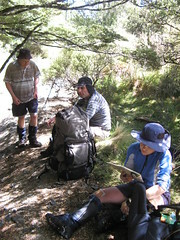 We reached the river at 9.40am, where two guys from Tauranga were camping having walked there on Friday afternoon. They‘d already encountered Geoff and Yibai who’d gone past some time earlier and continued up-river. 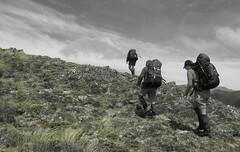 They were also intending to be at Waipakihi Hut that evening, so we’d expect to see them again later in the day. The weather was much calmer and warmer down in the valley. With no reason to rush, we stayed and chatted for a good 25 minutes. As we left, Craig made some more subtle comments about the unusual heaviness of his pack. 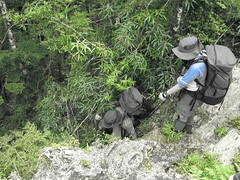 A few minutes further up the river, Geoff and Yibai popped out of the trees where they‘d set up a camp. They hadn’t had any luck yet. We updated them with our plans, and arranged to send a couple of people down the river to find them again if the weather became so bad for us to want to leave early. A couple of kilometres further up the river, we stopped for lunch at the base of Thunderbolt Creek. 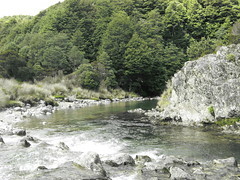 Much of the Waipakihi River has wide flats on both sides. 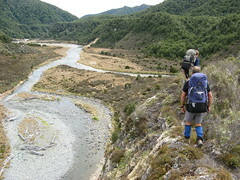 This point, where a spur comes down to meet the river from Te Hiwiokaituri Ridge was no exception. 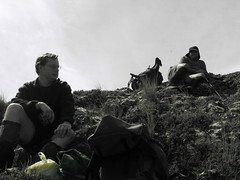 The time was only 11.30am and we were in no hurry, so we took advantage of a sheltered spot on the northern side of the spur, and sat down for some lunch. 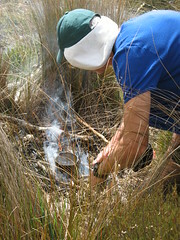 John used his skills to throw together a small campfire and heat water for a brew. He grumbled about how times were changing for the worse when Mike and I both told him we didn’t need any hot water once again. It was a nice day to have campfire smoke periodically wafting in one’s face, however, and we spent a good hour sitting, eating high quality lunches, chatting, and comparing the cheap altimeters with the expensive ones. It was only now that it became apparent that we actually had six altimeters between six people, albeit some of a more accurate nature than others. Mike was the only person without one, although Paul actually had two if we also counted his bright yellow GPS device. 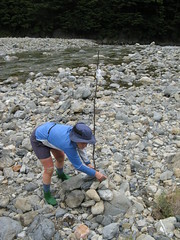 The wide flats along the edges of the Waipakihi River make it possible to walk much of the distance outside of the river, but it‘s often necessary to cris-cross it and, of course, we often found it more convenient to simply walk up the middle. On this occasion the river wasn’t at all flooded, and it was never necessary to wade through anything deeper than about thigh-deep water. There were quite a few deeper and slow moving areas which would have made good swimming holes, however. We nearly lost Craig shortly after 1pm, when we dropped off the flats down to a curve in the river at what I think was a grid reference of about 616238. Craig was last in the group at the time (or at least that‘s what we thought), but he never turned up when we sat down to wait. After about ten minutes of waiting and with some concern mounting, further investigation revealed there were several diverging tracks through the flats than the one we’d followed. It was possible that he might have dropped down to the river at a different place somewhere ahead of us, and missed us completely. Just as we were discussing the possibilities, however, Craig turned up, having been just around the corner for the entire time, ironically waiting for us. Somewhere along this stretch, we overtook the two guys from Tauranga, who’d passed us at some stage when we were hiding in our lunch spot. We stopped for a few minutes and had another chatter with them before continuing. At about 3pm, our relaxed pace dictated the need for yet another rest. Ruth was keen to find somewhere with shade, while John wanted some grass next to the river. The lack of locations to match all requirements caused some vigorous debate over the next ten minutes, but in the end we just stopped in the shade, except for John at the front who hadn’t noticed we’d stopped, and continued around the corner to find his grassy riverbank. This stop lasted another 30 minutes, during which time I’m sure I heard snoring. By now it was starting to get later in the day, however, and John asserted that there should be no more stops before we reached the hut. We picked up our things and got going again, with Craig making a few comments about the extra weight he thought he must have been carrying. Once again, we overtook the chaps from Tauranga, and this time they were quite surprised and confused to see us. Presumably they hadn’t seen us snoring in the shade. At 4.20pm, Mike and I (at the back of the group) finally saw what was either the Waipakihi Hut in the distance, or a very good cardboard cut-out imitation of it. I’ve sometimes thought it could be funny to build a giant cardboard cutout of a hut in the distance, but this time I hoped it was the real thing and was pleasantly rewarded for my optimism. Mike and I were the last two people to reach it. We wandered up the steps at 4.40pm, trying to look as authentic as we could as we strolled past a crouching John who wielded the impressive new camera he’d recently given his wife for Christmas, and added our soppy socks to the clothes line out the front. Nobody else was home at the hut when we arrived, but a couple of hunters had left their things in one of the bunk rooms. The hut has a bunk room on either end with six bunks in each, so the six of us picked the un-used room and filled it. 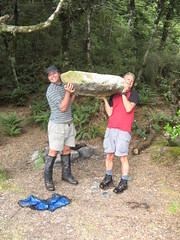 Not long after we’d arrived, the two guys from Tauranga caught up, and duly added their soggy socks to the line. The wind was starting to pick up in the valley by now. Paul even reported seeing a small waterspout forming over the river, so it appeared that our timing had been good. John settled into arranging some hot water for a brew, but grumbled about how times were changing for the worse when Mike and I both told him we didn‘t need any hot water. The next two people to arrive were a couple of British doctors, based in a hospital in Hawkes’ Bay. They‘d followed the same route as ourselves, but had only driven to the road-end earlier in the morning. The two of them were absolutely exhausted, which may have had something to do with all the extra effort they‘d gone to to avoid having to step into the river any further than ankle deep. Good for them, I guess. 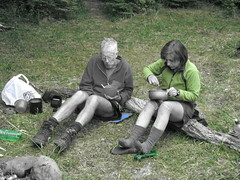 They got stuck into eating their cold dinner outside the hut within a few minutes of turning up. On our own side of things, John had nearly completed the task of accurately slicing two very large kumura into 1 centimetre cubes. Craig meanwhile, who’d been making subtle comments about the weight of his pack all day, produced what must have been the world’s biggest cucumber from his pack. Only a third of it (at best) went towards a dinner for six people. Much of the evening was spent with the other inhabitants of the hut, collectively working on crossword puzzles which Paul had brought. The hunters still hadn’t returned by the time we’d all gone to bed at around 10pm’ish, although we heard them in the other room not long after. We woke on Sunday morning at a little before 7, and first impressions of the day were much better than what several of the contradicting forecasts would have had us believe. There was a little wind outside, but the high clouds weren‘t moving fast and it looked very feasible to be walking over the tops. John boiled some water on the hut stove for a brew, although he grumbled about the state of tramping and younger people as Mike and I didn’t want any. The two hunters were up and about very shortly after we’d begun to make significant amounts of noise, and they were quite helpful with information regarding what we were keen to do during the day. They’d both been up to point 1475 the previous evening and half way down one of the spurs near it, where they said it’d been extremely windy and a waste of their time as far as any hunting was concerned. Despite their claimed lack of success, there were still a lot of flies buzzing around one particular corner of the outside of the hut that morning, which made us suspicious as to whether anything had been left nearby. The British tourists were first away, with a plan of walking back to the road by that evening, via the Umakarikari Range on the north-western side of the river. Our own group left shortly behind them at 8am. Watching them from a distance, they did a very adequate job of getting through the river without having any water seeping over the top of their boots prior to ascending up the track on the far side. The book at Waipakihi Hut had had a big warning scribbled in the front, apparently courtesy of Air Charter Taupo, reminding everyone that the nearby private land was being monitored and that people should stay away from it unless they had a permit. This reduced our options because the private land in question had a nicely drawn corner of a triangle jutting over about 3 kms of ridgeline that we would have liked to walk. Not everyone in our group was in possession of a suitable balaclava to hide our identities, and none of us had packed any giant motorised pogo sticks that might have assisted us to leap over many kilometres of private forest in a single bound. 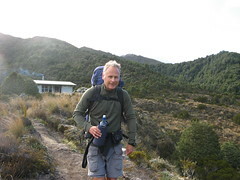 The prospect of the looming Air Charter Taupo attack choppers buzzing us along the ridge wasn’t inviting, so following the main signposted track from the hut and dashing across 3 kms of ridgeline wasn’t an option. We therefore decided to head up an alternative spur to point 1475, south of the hut, and bypass the pointy corner of private land as much as possible. There’s a well-walked route up the spur to 1475, which shouldn‘t be much of a surprise since I bet a lot of people had done the same thing before we did it. It’s not obvious from the bottom, though, and it was fortunate that Paul had been here once a year before. We also got some directions from one of the two hunters. The only obstacle in getting to this spur, which is probably more of an issue for people who try to walk directly from the hut, is an annoying gully which needs to be either crossed or circumvented. It‘s perhaps on the order of about 15 metres deep and quite steep on either side, heading north-south, almost 600 metres west of the hut (from the south side of the river). My TerraMap marks it as a stream, but at the time we visited there were trees growing along the bottom, and no obvious water above ground. Having walked straight from the hut, we had begun from the eastern side of the gully accidentally, before Ruth managed to find a way down into the thing and up the other side. 25 minutes after leaving the hut, we were at the base of the route through the trees on the western side of this gully. The spur and the route itself becomes more obvious after a little roaming around at the lower end and then following a bearing to the south for a few minutes. In our case, Paul went up front and scrambled through the bush to help find it, since he was vaguely familiar with it having been there before. After this, getting up was fairly straightforward with the exception of a little bush lawyer. Several unofficial markers are tied to trees near the top end of the track, although they’d probably be more useful for finding the top of the spur on the way down. We cleared the trees shortly before 9am, and immediately some great views opened up towards Ruapehu and Ngauruhoe. We also had a better view towards Middle Range, where we’d been hoping to go. Unfortunately it looked very clagged in, and was probably sheltering us from some bad weather. By 9.30am we’d reached point 1475, and assessed our options. The first of these options was to try Thunderbolt, along Middle Range, but that no longer seemed as inviting considering what we could see. There were also a couple of other nearby ridges, however. One of them was an un-named ridge (actually more of a spur) that heads almost directly west, but slightly south, of 1475, and would have been a good option if we’d wanted to get down to the river quickly without heading straight back to where we’d come from. The other ridge, named Te Hiwiokaituri Ridge, heads south-west on the inside of Middle Range, and this one seemed much more interesting. So we continued a little further south towards point 1506, taking absolute care to circumvent the outside of the imaginary boundary of private land, which shaved the wide-ish ridge that we needed to cross. Point 1506 was reached at about 10.10am, and from there it was a walk roughly south-west over the tops for several kilometres towards point 1600. The wind even died down along this section, which I think might have been related to the sheltering positioning of Middle Range in the distance, although I’m no expert on such things. Mike and Craig at brunch. All the way along Te Hiwiokaituri Ridge, we had fantastic views of Ruapehu and Ngauruhoe, walking generally towards them for the entire time. We sheltered on the north-western side of the ridge 40 minutes after leaving point 1506, somewhere below quite a long saddle, roughly at grid reference 636232 and stopped for brunch. The pace was still quite relaxed given that the weather felt reasonable. Brunch lasted about 20 minutes, during which time I played with taking bearings on things and identified parts of the river below. Point 1600 was quite a climb from the lower part of the ridge, and as we approached it, it almost looked feasible to try sidling it. John felt quite strongly about such things, however, and insisted that because the name of the club was the Wellington Tramping and Mountaineering Club, we should definitely go to the top. And he was correct about the name. If anyone had even proposed changing the name to the Wellington Tramping and Sidling Club, let alone voted in the change at a recent AGM, then one of us would probably have known about it. As it turned out, the discussion was redundant. Having walked another hundred metres or so it became clear that the side completely dropped off and sidling would have been very difficult if even possible. Point 1600 was reached at about 11.45am, and standing on top of it allowed us to have a very nice view of the entire surrounding area, including where we’d come from and where we were going. We sat around and surveyed things for about 25 minutes before beginning our drop down the spur on the north-western side, towards the river. The initial parts of this descent are quite steep, and although the presence of quite a lot of scree makes things easier, Mike and I got into a discussion towards the back of the group about how neither of us really like some of the situations in tramping where there’s not much room for making mistakes. The discussion stopped abrubtly a minute later, when we realised that the track sidled around a wide pinnacle-like structure (point 1490 on the map), with a steep drop-off to the rocks below on either side. This was definitely one of those awkward situations in which a small mistake could result in a serious injury. Everyone else had already gone around to the other side by the time we reached it, and after some surveying we decided that the right-hand side (to the north) would be preferable for sidling, despite the most obvious track heading around the other side. This had something to do with the sharper and further drop-off to the south. In hindsight, I think I would have preferred the southern side, because the northern route required a small amount of climbing without good hand-holds, and for which I wasn’t very prepared. We got there, though, and Craig was waiting for us on the other side. 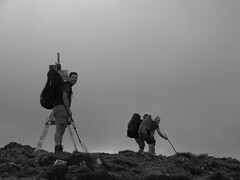 By now it was about 12.20pm and John, Paul and Ruth had already raced ahead along the spur. We could see them heading over the top of the ridge in the distance, even though it looked as of the most heavily used track was heading along the southern side of the spur and quite a long way down the side from the ridge-line. After following this track for some distance, we eventually decided we‘d be better off getting up to the top, just in case the paths diverged or we walked past them. It was just as well because shortly before 1pm, we found the three of them having stopped in a rather steep (but very stable and scenic) area along the top for lunch. John boiled some water in his billy for a brew, grumbling about the current state of tramping when Mike and I didn’t want any. We sat down for lunch and a rest at about 12.45pm, while Craig and John embarked on a conversation all about bicycle shops, and the problems they’d experienced with getting bikes repaired. An hour or so later, we continued directly down the spur after lunch, but very quickly found that any hint of a track dropped away suddenly, quite literally. After John’s efforts to climb further down the spur amounted to nothing, we eventually noticed a much more worn track about 50 metres down the southern side of the spur. This was possibly the same track that Craig, Mike and I had left before lunch, although we didn’t know for sure. A little back-tracking allowed us to find a variety of ways down, and travel became much easier until the edge of the bush-line at roughly 2.10pm, where the track ended abruptly with the signal of somebody’s grotty old sock tied to a tree. Looking ahead, it appeared as if people had tried to push through the bush in several directions, but no clear passages lasted for longer than a few metres at best. Presumably the sock was there for a reason, however. Ruth, John and Paul in particular spent some time looking around while the rest of us waited at the entrance, not really wanting to exacerbate the problem by all wandering off in different directions. Eventually we found a clearing after pushing almost straight ahead through the dense growth for about 30 metres (at a guess), slightly uphill from the entrance point. From here on, travel down-hill was fairly straightforward considering the circumstances, with Ruth and I staying towards the back to make sure that those ahead remained on the correct bearing. We were able to follow a bearing of 172 degrees to head straight down the spur, with the main hindrance being recurring patches of bush lawyer to scramble through. From the way things looked, it appeared that this path had been walked many times before. It diverged from the bearing on occasion to get around big trees and the like, but always returned again. The trap that we fell into was to end up on another spur which headed south-west off the side of the main spur, starting from about the 1250 metre mark. At about that point, the track did appear to split into two, as Ruth noticed from the back after most of our group was well past it. We followed the track on the left because it still had the correct bearing, and those at the front had already invested significant amounts of effort getting through more bush lawyer. A few minutes later however, Ruth pointed out that the higher trees on our right made it look as if there was a higher spur over in that direction, which ultimately shouldn’t have been there. She was right, of course, and at 2.45pm we ended up sidling around the hillside to climb back up to it. We’d been following a 172 degree bearing on the incorrect spur, but the fact that it was quite wide at the top had probably meant that we’d been shifted too far to the left, and were walking across the top of it rather than directly down it for some distance. It probably wouldn’t have been a disaster regardless of which spur we’d come down, since they both appeared to be a shallow gradient on the map although the incorrect spur would have put us about 500 metres up Thunderbolt Creek, rather than on the confluence. The only complication we had towards the end was a bit of a drop off shortly before the river. After some hunting around we got down by sidling around to the left, where we picked up another well-worn track. Standing on the flats at the confluence of Thunderbolt Creek and the Waipakihi River, we were now back at yesterday’s lunch spot. The time was almost 3.30pm. We continued back along the river to the south-west, now retracing our steps from yesterday morning and keeping an eye out for Geoff and Yibai, whom we expected to be camping along here somewhere. They were no longer at their previous camp-site when we arrived, however, so eventually at 5pm, we decided to simply set up camp for the night in approximately the same spot. The location seemed a little exposed to the wind, but we had two-person Huntech flies which tend to be quite good in the wind if they’re pitched well. Interestingly enough, pitching them well was a task that we had a few issues with. Paul discovered that the pole of the fly he was setting up wouldn’t fit properly through the sleeve for some reason. Meanwhile when I was struggling with my own, which was more tight than usual (possibly due to expansion from the heat), I heard a big snap from inside the sleeve, which caused me a lot of concern until I was able to pull it out again and discover that the pole had only snapped at the join, and could simply be slotted back together. By the time we had two and a half flies set up, Ruth wandered up having been for a walk further down the river, and announced that there was a much better camp-site about five minutes’ walk away. Despite the effort we’d already expended, Ruth did a good enough sale job to convince us to pull down the flies and start walking again. Sure enough, about another five minutes along the river on the true right, there was a very nice and sheltered camp site, which was definitely preferable given the forecasts we’d seen before leaving. John and Ruth at dinner. The three of us who carried flies once again began the task of putting them up, and it was all done by about 5.30pm. John, meanwhile, built a small camp fire and heated some water for a brew. 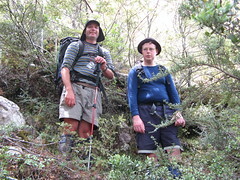 He grumbled about the state of tramping as it became clear once again that Mike and I weren’t big tea drinkers. The genetically engineered cucumber that Craig had brought with him still had about two thirds remaining, and that came out again for dinner, as well as a gratuitous 2 cups of parsley that John had brought. Cooking dinner was an interesting exercise due to reasons that included the unstable see-saw log, on either end of which Craig and Mike were sitting. Both of them were playing with gas cookers and very hot water. We sat around working on yet more crosswords as the evening continued, and tried to take macro photos of an unusual looking spider. Paul kindly volunteered to do the dishes on Sunday night, and we named the location Dishwashing Flats in his honour. We had still been a bit uncertain about Geoff and Yibai, who were respectively needed for driving the bus home, and for opening and shutting the door. Being in the trees, our campsite wasn‘t particularly visible to anybody who might wander past along the river, and if we weren‘t able to find them, the only arrangement we had was to meet at the road at about 3pm on Monday. With this in mind, Ruth came up with the idea of building a cairn next to the river to draw attention to where we were camped. The final result had a big stick poking out of it with a bag of Tararua Biscuit crumbs hanging from it, and it would have gotten the attention of anyone who saw it. Geoff did find our camp site as he was walking past at about 9pm, although he found it thanks to the smoke from the camp fire. He and Yibai had moved their camp further down the river, which was why we hadn‘t found them earlier. From his description it sounded as if the two of them had had a huge day zig-zagging all over the place. We invited him for a cup of tea, but he looked exhausted and was more keen to just get back to his camp. After John had interrogated Geoff for several minutes about how impressive his rifle was, we left it at arranging to leave quite a bit earlier the following day, possibly even walking out with them. It rained very early on Monday morning, which was the first rain we’d actually seen on the entire trip. Only my own fly even got wet on the outside, which was the consequence of a gap in the trees. Everyone was up a bit after 7am, at which time there was a very light misty moisture hanging in the air. John heated some water for a brew, but grumbled about the state of things as Mike and I declined his offer. 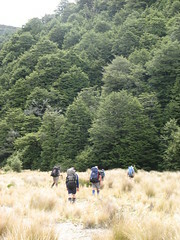 The six of us had packed up and left by 8.15am, at which time we headed for the base of the Urchin Track. Personally I didn‘t get my feet wet at all since there was a track in the trees on the true right of the river for that entire distance, although Paul led a contingent on the other side of the river, and they actually reached the Urchin Track slightly before us. It was only a 10 minute walk in any case. We thought we might have found Geoff and Yibai waiting for us here, but if they had been they‘d already left. They might have been up early hunting again, and we assumed we’d probably find them at either the road, or on the way there. Craig and Paul ran up the Urchin while the rest of us followed at a slower place. 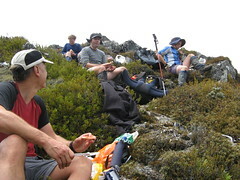 We’d reached the bush line by 9am, with John now having mentally collapsed into an endless circle of muttering under his breath about young people who no longer drink tea and eat muesli bars for breakfast and have hoses coming out of their packs. It sounded as if he was about to break into a violent tirade of shouting “GET OFF MY LAWN”, but he became distracted when we finally caught up to the place where Craig and Paul had stopped to wait for us, 40 minutes after we’d reached the bushline and roughly near point 1391. Craig and Paul accused us of having stopped for a brew, although I think this was probably one of the few times that John hadn‘t. We sat near 1391 for 10 minutes, during which time we thought we could see at least one person in the far distance, veeeeery slooooowly walking along the ridge up towards Urchin. It crossed our minds that it might be either or both of the two people we were looking for, but it also didn’t seem as if either of them would be the type to be walking so slowly. We did catch up after we got going again though, and to our pleasant surprise it turned out to be both of them. From Urchin, which we reached at 10.10am, the trip was a fairly routine and relaxing walk down the hill on the soft track towards the bus. We reached it an hour later, at which point John pulled out his cooker and his billy and heated some water for a brew, grumbling about the state of tramping in New Zealand as Mike and I declined his offer. At Geoff’s recommendation, we stopped at both the Waikato Falls and Tree Trunk Gorge on the way back, both of which are within easy reach of the area and which I’d thoroughly recommend. We also had to stop at Bulls on the way back to fill the bus with more diesel, and to check a broken indicator. It was a nice opportunity for stretching legs and eating ice cream on a hot day, except for Paul and John who went to the cafe down the road for a cup of tea. John was probably complaining to some poor waitress about the state of tramping in New Zealand. Our return trip to Wellington provided one of the best panoramic views of the Tararuas I’ve had the opportunity to see so far. It was probably a combination of the still weather and high cloud which meant the view from Foxton showed a high contrast silhouette of the entire range. 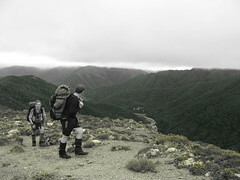 4 Comments To "Trip: Urchin, Waipakihi River, Te Hiwiokaituri Ridge"